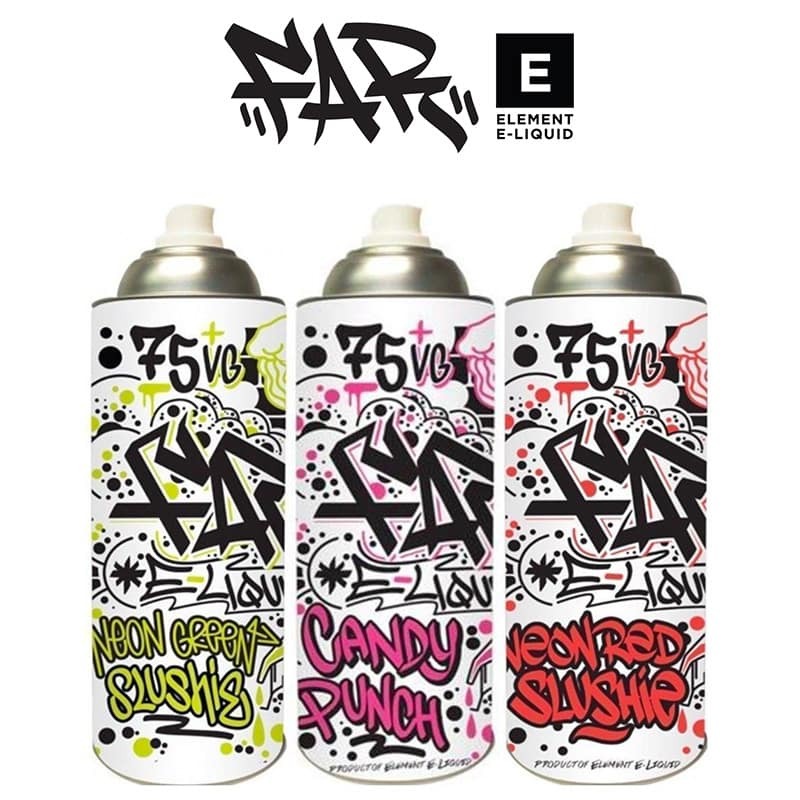 FAR E Liquids are a range of juices from the renowned Element stable, featuring a 75% VG mix ratio formulated to provide the densest clouds from a dripper or sub ohm tank, as well as still providing a maximum flavour punch to your palate. 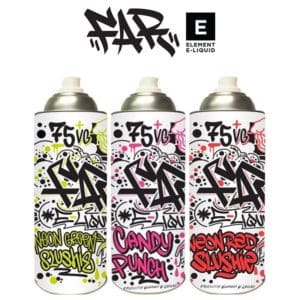 Candy Punch – An intoxicating candy blend, this vibrant coupling of sweet and colorful fruit come alive with every puff. Brimming with mind-blowing rainbow candy, this delectable treat is the golden ticket to relive those fond childhood memories. Grape Vape – A palate-pleasing union of bright and fragrant grapes coming together for a delicious vape certain to satisfy your sweet tooth. Marshmallow Breeze – Full bodied infusion of luscious creamy marshmallow with a cool sensation. Enjoy a deliciously romantic creamy marshmallow treat with a lingering cool sensation that sparkles on the palate a lively symphony of flavors. This divine fusion of guiltless, luscious peaks of sweet marshmallow is tempting, tasty and positively delightful. Melon Ball – Sit back and relax with this unique fusion of a feel-good summer cooler. This medley of sweet and juicy melons, is the perfect antidote to keep you cool and beat the heat. Neon Green Slushie – Cool down and chill out with our thirst-quenching sumptuous combination of intense neon green lime over endless slush ice. This zesty lime is sweetened to perfection making it the ideal taste bud tamer. Neon Red Slushie – This e-liquid is a refreshing frozen concoction blending the flavours of blackcurrant, watermelon and strawberry. Pineapple Bliss – Juicy, vibrant pineapple kissed with sweet berries and succulent mango, a true tropical taste creating the perfect gateway to your own personal island. Strawberry Cupcake – Enticing and tantalizing, this guilt-free treat is a myriad of luxurious vanilla cake layered in swirls of pink icing. Rich in flavor and clouds, this blend is reminiscent of a delightful creamy strawberry cupcake dream.